Are the CRA really non-political? Firstly, I should say that much of what follows is lifted from the CRA website. The CRA hears this question a lot and I am sure we will hear it a lot more as we approach the local elections in May. We have also received one email asking the same question. In order to answer this, we need to go back and see how we found ourselves in this position. We are fully aware that the CRA members voted in 2014 to remain non-political. Since that time the CRA has had a measure of success; again these are documented on the website, although we are the first to admit that we have barely scratched the surface. There have been some very positive advances, particularly in the regional assembly, but these only clear the way for greater steps forward, towards contributing to the quality of life for the people of Camposol. Indeed, even these successes have only been achieved with the help of others. Looking forward and particularly toward the May 2019 election, members of the CRA had to ask themselves how they could best achieve their goal of ‘working together for the future of Camposol’. The CRA committee feel that they are struggling to achieve their goals without the political support at the local level of Mazarrón Town Council. Furthermore, a lot of what the CRA is working towards could easily be argued as ‘political issues’. This is a very long list, but it includes street lighting, making roads and pavement repairs good to addressing the issues in Upper C. Without true political muscle we were not sure we could achieve these goals. I should stress here that the committee debated long and hard whether to go down this route. The unanimous conclusion was that members would want us to do all we could to make a positive difference for Camposol. We, the committee, were appointed to act in the best interests of the CRA and it was felt that the majority would want what is best for Camposol. Indeed that is what we are here for! We do not want to be, and will not be, taken over by any political party and do what is best for them. However, we want to make it absolutely clear that we are only here for what is best for Camposol. We want to remain non-political, so that we can recommend a party to the residents that will have the best chance of achieving what we all want for Camposol. We feel that making friends with people of a like mind within the system, including getting Camposol residents elected, is better than getting one or two people on a protest vote, who considers everyone else as enemies. 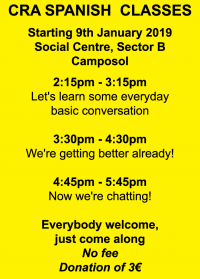 Whilst we will cover this more in next month’s issue, the CRA decided some time ago to invite all of the voluntary groups on Camposol to get together and discuss how we can work together better. The CRA does not want to take over any groups, any finances or anything else. However, it might be beneficial to link the voluntary groups through one website and one voice. We welcome opening a dialogue on this in the forthcoming weeks.